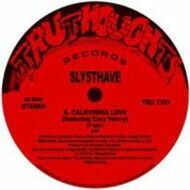 California Love (featuring Cory Henry) [7” EDIT]” / “Shiznit” is the 7” single from multi-instrumentalist Sly5thAve’s ‘The Invisible Man: An Orchestral Tribute To Dr. Dre’ LP. In this instalment, a rework of Dre’s notorious “California Love” is paired with Snoop Dogg’s timeless “Shiznit”. Off the back of an incredible reaction to 'The Invisible Man: An Orchestral Tribute To Dr. Dre' and to mark the start of Sly5thAve’s first tour, we present this limited 7” pressing of two of the album’s standout cuts. Now on its third pressing, the album continues to pick up fans and plaudits alike. As you may have noticed, the 7” label is based on the famous Ruthless records design.